Strategically located in the crossroads of South East Asia, Malaysia offers a range of excellent cruising destinations for yachts. An archipelago made up of 99 islands on Malaysia’s west coast, Langkawi is a gorgeous cruising area. With high cliffs surrounded by turquoise seas, and some of the finest beaches and bays in the world, Langkawi is the perfect place to drop anchor and explore. 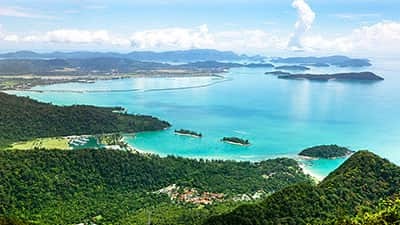 With less than 20% of Langkawi developed, and the first UNESCO Geopark in Southeast Asia, there are a breathtaking mixture of mangroves, waterfalls and mountains for hiking. Spend a day sightseeing at the wildlife sanctuary, Kilim Karst Geoforest Park, lounge the white sand beaches at Monkey Beach, or go snorkelling in heavenly Pulau Payer, a marine park with crystal clear waters and gorgeous coral reef. Known as the “rice bowl of Malaysia”, there are no shortage of restaurants to scope out. Taste traditional Laksa or Beef Rendeng at Langkawi’s street market, dine in any of the restaurants along Pantai Cenang Beach- the most popular beach in Langkawi. Explore Ko Rawi and Ko Adang, uninhabited islands with shimmering turquoise waters, lush rainforests, enchanting waterfalls and bright coral reefs.